Apartment Project Berlin is a space for collective living, aiming to be a meeting point for international artists towards productions with interdisciplinary approaches. Moving from Istanbul, feeling the urge to come up with new ideas in a new surrounding, geography; the project is trying to take risks, eliminate the great expectations by questioning the notion of success while discontinuously transforming. The first project to be realized is “Underconstruction Berlin”, focuses on the notions that one may observe in every corner of the beloved city of neoliberal agendas; while reflecting on the memory of revolutions, cabarets, wars and The Wall; migration and its manifestations. Putting two cities, Istanbul and Berlin, in dialogue, examining the relation/translation between two cosmopolitan cities is another attempt. The shop window of the space presenting inside to outside/outside to inside, allows the encounters not just between human beings but also with the daily life and spirit of the city. The artists ask questions, try to find answers and/or solutions while getting lost, changing directions and leading to new possibilities. 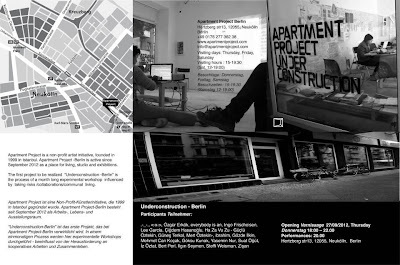 Apartment Project Berlin is active since September 2012 as a place for living, studio and exhibition space. During the workshop throughout September, there will be artist talks, presentations and performances – suggesting performing as a way of living - that are in dialogue with each participating artists’s curiosities. Collaboration and idea exchange between artists is mediated through these events. Converted from a motorbike shop, the project accelerates by internalizing the power absorbed by the space itself. The first project Underconstruction is a situation/collaboration/a state of living. The invited artists live, eat, work, exhibit, perform; negotiate, discuss, laugh and fight, change the costumes of the daily life in the same space for the month of September. What one would see are boxes, books, nylons, drawings and words; heads that are spreading ideas, mentioning margins, radicalization, the political situation of the city as well as the queer culture, the contemporary music scene; channeling potentials from the past, performativity, costumes, cabaret, creating music from the everyday experiences; history and politics of the immigration and the city. The space becoming the skin of the artists, communal living experience allows for intense engagement among the participants and alternative production processes. We are happy to announce the first exhibition opening with a performance/cabaret on the 27th of September at Hertzbergstrasse 13. We would be glad to share this night with you. A publication documenting the one-month period of producing and compilation CD will be completed and sent to the space once the artists go back to İstanbul.